Lunæ, 14 die Aprilis, 1679. Corfe Castle, &c. Returns amended. Lords Proceedings respecting Lords in the Tower. Conference on Earl of Danby's Attainder Bill. ORDERED, That the Clerk of the Crown be called in, to amend the Returns for the Boroughs of Corfe Castle and East Grimstead. And the Clerk of the Crown being called in, did, according to the Order of the House, amend the said Returns. 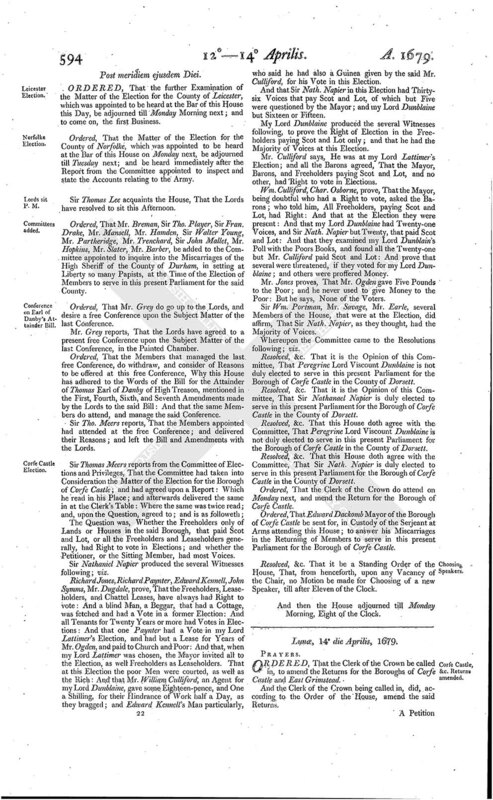 A Petition of Joseph Sawle Esquire, complaining of several undue Practices in the Portreve of the Borough of Tregony in the County of Cornwall, and the High Sheriff of the said County, in returning John Tanner Esquire, to serve in this present Parliament as Burgess for the said Borough, in Injury of the Petitioner, who ought to have been returned, was read. Resolved, &c. That the said Petition be referred to the Consideration of the Committee of Privileges and Elections; to examine the Matter of the Complaint; and report the same, with their Opinion thereupon, to the House. Mr. Powle, being elected to serve in this present Parliament, both for the Borough of Cyrencester in the County of Glocester, and for the Borough of East Grimstead in the County of Sussex, makes his Choice to serve for the said Borough of Cyrencester. Ordered, That Mr. Speaker do issue out his Warrant to the Clerk of the Crown, to make out a new Writ for the Electing of a Burgess to serve in this present Parliament for the Borough of East Grimstead in the County of Sussex. Ordered, That a Committee be appointed to inspect the Journal of the House of Lords; and see what Entries are there made, of any Orders touching the giving Copies to the Lords in the Tower, of the Examinations of the Witnesses against them. And it is referred to Mr. Treby, Sir John Trevor, Sir Henry Capell, Sir Thomas Stringer, Mr. Powle, Sir Francis Winnington, or any Two of them; and to make Report thereof to the House. Ordered, That Sir John Lowther, Sir Nicolas Carew, and Sir Robert Reeves, have Leave to go into the Country. Resolved, &c. That the House will, on Wednesday next, at Ten of the Clock, take into Consideration the State of the Kingdom in reference to the Militia. Resolved, &c. That this House will, on Thursday next, at Ten of the Clock, take into Consideration the State of the Kingdom; and how the Navy may be made more useful for the Defence thereof. Ordered, That the Matter of the Election for the Borough of Bewdly be adjourned till Friday in the next Week after Easter Week. ORDERED, That the Matter touching the Election for the Borough of Bewdly be heard at the Committee of Elections and Privileges, on Wednesday next in the Afternoon, if the House shall sit that Afternoon: But if the Committee shall not then sit, then that Election to be heard on the first Friday after Easter Week: And that the Hearing of all other Causes before the said Committee be suspended until the said first Friday after Easter Week. Mr. Speaker, The Lords desire a present free Conference with this House in the Painted Chamber, upon the Subject Matter of the last free Conference. Resolved, &c. That this House will meet the Lords at a present free Conference, in the Painted Chamber. And the Messengers being called in; Mr. Speaker acquaints them, That this House did agree to meet the Lords at a present free Conference, in the Painted Chamber, upon the Subject Matter of the last free Conference. Ordered, That the Members that managed the last free Conference, do attend and manage this free Conference. That the Lords hoped this would be a concluding Conference. 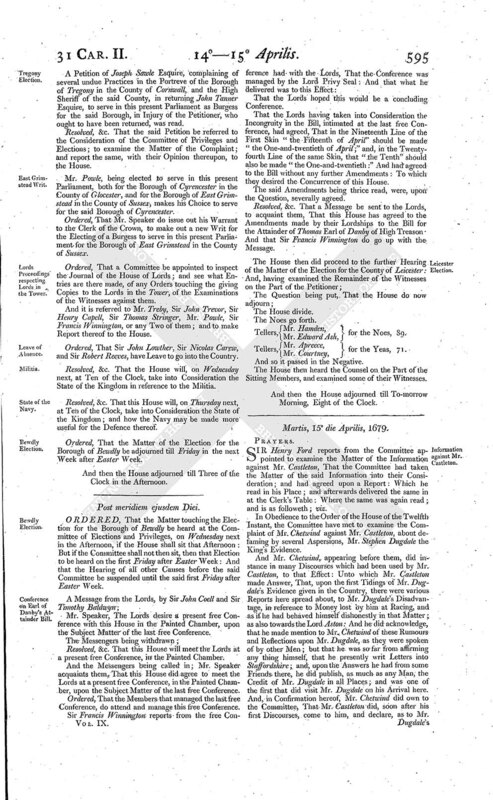 That the Lords having taken into Consideration the Incongruity in the Bill, intimated at the last free Conference, had agreed, That in the Nineteenth Line of the First Skin "the Fifteenth of April" should be made "the One-and-twentieth of April;" and, in the Twentyfourth Line of the same Skin, that "the Tenth" should also be made "the One-and-twentieth:" And had agreed to the Bill without any further Amendments: To which they desired the Concurrence of this House. The said Amendments being thrice read, were, upon the Question, severally agreed. Resolved, &c. That a Message be sent to the Lords, to acquaint them, That this House has agreed to the Amendments made by their Lordships to the Bill for the Attainder of Thomas Earl of Danby of High Treason And that Sir Francis Winnington do go up with the Message. Tellers, Mr. Hamden, for the Noes, 89. Tellers, Mr. Apreece, for the Yeas, 71. The House then heard the Counsel on the Part of the Sitting Members, and examined some of their Witnesses.